Western Digital reveals the WD TV Play, a new media player that streams content from other networked devices directly to your HDTV. The device is now available for $69.99. 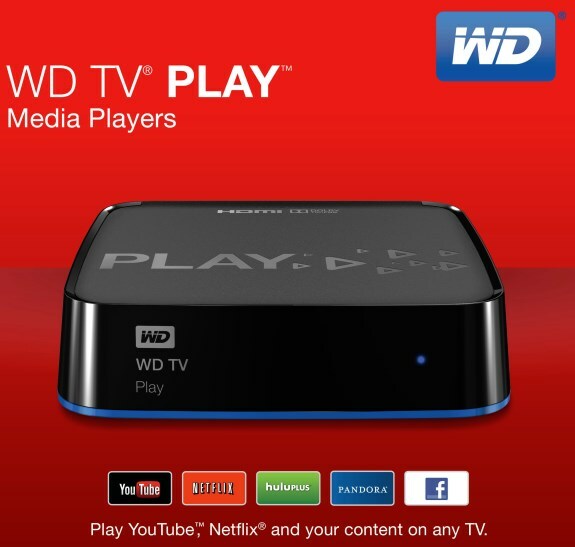 WD®, a Western Digital (NASDAQ:WDC) company, and a world leader in storage solutions for the connected life, today unveils WD TV® Play™, a versatile media player that streams popular Internet channels, as well as personal photos, music and movies from other networked devices in the home, directly to an HDTV. Priced at just $69.99 USD, WD TV Play expands upon the existing WD TV family of products, offering an engaging new app-based user interface to allow customers to easily personalize their entertainment experience. With the Wi-Fi® connected WD TV Play media player, customers can easily stream hit movies, view the latest viral videos, catch up on TV shows and stay connected to social networks through apps such as YouTube®, Netflix®, Hulu Plus™, VUDU®, SlingPlayer®, Spotify®, Pandora® and Facebook, among many others1. Unlike many other streaming media players, WD TV Play also lets customers enjoy a variety of media they already own, such as photos, music and videos. Customers can play content located on any computer or network attached storage that has a DLNA (Digital Living Network Alliance) server, such as the My Book® Live™ personal cloud storage, as well as from any directly connected digital camcorder, camera or USB drive. WD TV Play's high-speed wireless or Ethernet connections support Full-HD 1080p video streaming. The setup process is simple and intuitive so that customers are up and running in minutes. Once connected, customers navigate a familiar-feeling app-based user interface to play their entertainment or personalize their home screen with favorite apps. Customers can also set their favorite app to automatically play when WD TV Play is turned on, perfect for listening to music and running a slideshow of photos. WD TV Play's new remote control features pre-programmed buttons, giving customers one-touch access to their favorite apps. Customers can also download the free WD TV Remote™ app to turn their iPhone®, iPod touch®, iPad®, or Android™ compatible mobile device into an advanced remote control. WD TV Remote connects over the home wireless network and works with multiple WD TV media players in the home. "We are excited to bring popular Internet channels and the ability to play personal media from other connected devices in the home, to budget-minded customers," said Scott Vouri, general manager for WD's connected life solutions group. "Those features and our new, easy-to-use interface make WD TV Play a product that brings smart-TV benefits to a wide range of people."